These are cute little tuna appetizers made to look like watermelons. Great for parties, they make perfect finger-food, and are much less work than making a whole bunch of sushi for a party! Not to mention, they are delicious! This recipe has a lot of contrasting flavors. The cool of the cucumber versus the heat of the Siracha sauce. The soft, yielding texture of the tuna, as opposed to the snappy crunch of the cucumber slice. The creamy flavor of the mayonnaise versus the clean, fresh flavor of the cucumber and tuna. So it’s not really sushi – no sushi rice in the recipe – but sushi lovers will love this dish! I got this idea from Sushi American Style by Tracy Griffith. Mix with mayonnaise and Sriracha sauce. 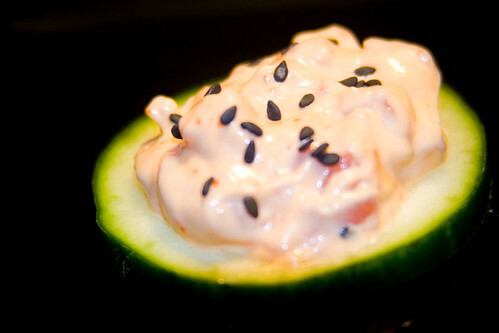 Top each cucumber slice with a small scoop of the tuna mix. Sprinkle a few sesame seeds on top, so it looks like a watermelon with black seeds. Um, what’s tobiko? Is that the mayonnaise? It’s not in your glossary. Yvo – You will love this! Canned tuna should work too, but if you ever get a chance, try it with the sashimi! So good! Kelly – Oops. *blush* My mistake, when I was writing the post I mistakenly thought I had put tobiko in the dish. Tobiko are tiny orange fish eggs, like seen here. Looks great! 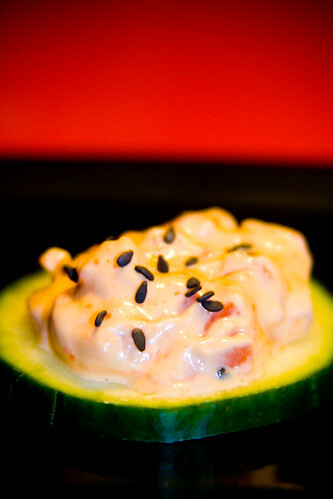 I love all things served on cucumbers, especially when they are easy to make. FYI- you have “1 cup sumeshi” in the inigredient list. It was great i used the recipe for my school presentation on japanese food. Carolina – I’ll bet it’s nearly as delicious with canned tuna as it is with sashimi. Helen – Awesome. How did everyone like it?